Hey there! And thanks for stopping by the blog. If you don’t know who I am, my name is Amy & I am the blogger behind I Heart LOA. Where we talk about all things Law of Attraction, Manifesting & Personal Development. *This is an updated version of this blog post! How I Heard About The LOA Planner. Once I got to the site, I saw the original planner that was re-usable. But then I saw the one year planners that were in all different colors. And had all this information that helps you use the Law of Attraction in your daily life! It had a page that helped you track your vibrations scale, etc. So many neat things that I was sold on the idea of it already! I was lucky enough to receive my very first LOA Planner free for writing a post about it. But it truly was the easiest post I have ever written because I fell in love with the Planner. And still use it to this day. And not only that, but I use it every single day. It sits right beside my laptop on my desk and is always open to the week that I am on. Now, The Reason You Are Here. How I Am Using My Law of Attraction Planner. I know, I know get to the point right? The planner is so much more than just your everyday planner. It has so much information in it that will help you with your LOA journey. Especially if you are on a spiritual awakening like I was when I first got mine. It’s not just a calendar where you can write in errands you have to run or bills that are due. It’s a whole new way of life. And it’s a way to keep me accountable with my vibrations on a daily basis. It also helps me keep up with my habits that I am making every day and staying grateful for what I have! One thing that has truly helped me in this planner is the weekly pages. The weekly pages are set up so that you have room to write your top 3 priorities for each day. So that you can really focus on what you need to get done that day. It has a habit tracker on each weekly page layout. I use the weekly pages to write down my weekly priorities. Then on each day, I can break these down into actionable steps to help me reach my goal by the end of the week! It truly is a great way to tick off your goals. I love the little victories section of the pages. I wish they would have made a single page for this section. Because writing down my small achievements or small wins has truly helped to motivate me to keep on going for my dreams! I know it sounds so simple, but since I have been taking the time to write down any and all small victories in my life, it has kept me motivated to keep on pushing thru when I have felt like giving up on my dream a million times! 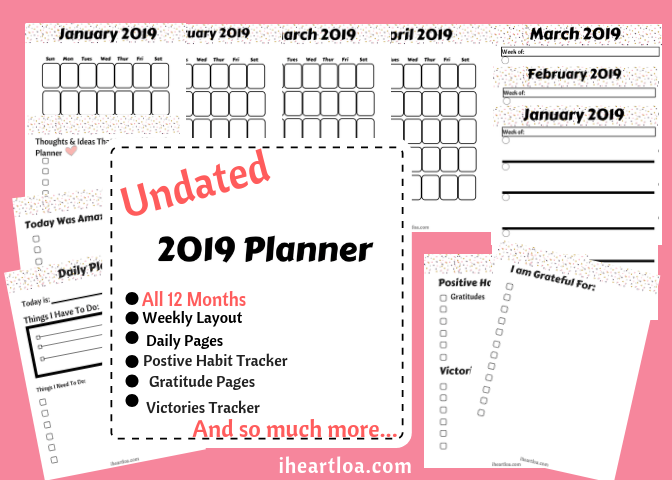 One way I use this section of the planner is every time I get a new subscriber or anything to do with my blog that is a small win, I write it down. You don’t know how many times this has helped me to keep on going with my blogging. Even when I felt like no one was coming to the blog or reading anything I was writing!! That is one of the major things that has helped me keep on pushing thru to my dream of being a full-time blogger! It’s the little things like this that really make you think. And when you can reflect back on them it really helps keep you motivated! Make a Clear Strategy- like how to let go of your old story and create a new one, program your mind for success, etc. What makes this planner so different than others? What have I given today? In what ways have I been a giver today? These are just a few examples. There are questions throughout the planner that really makes you stop and think about your life. And really opens your eyes up to your life & how you want your life to be. I just think it’s an awesome planner. And I couldn’t recommend it more. You can find it on on Amazon or by going to Freedom Mastery. If you sign up for their email list while on their website, you can get a discount. And every planner ordered they plant 5 trees in return! So that’s cool! *I am not affiliated with Freedom Mastery or Amazon. Just to let you know. I just really love their planners & I think you will too! I really hoped you enjoyed this post. And if you did, please take the time to share it out. That would mean so much to me. I am trying to grow my blog. And I am having so much fun blogging! It really is my passion! Meeting other people out there that resonate with what I write about. And finding other people that are into the Law of Attraction is really cool. Here are some other articles you might like to read on manifesting & the Law of Attraction. Especially how my life has changed since learning about the LOA. And I have made a PDF for you. It’s a Law of Attraction Quick Tips Guide. This will help you get back to the basics of manifesting. If you would like a copy, just click the link! Let me know you stopped by, say hi! Feel free to leave a comment in the comment section! If you have anything you would like to see on the blog, let me know. Here’s a video & some pictures that went with the original post. Thought I would leave them in.